For many content marketers, Millennials, who have $1.3 trillion in annual buying power, are an attractive Achilles heel. As John Boitnott writes in Inc., Millennials’ resistance to content marketing occurs when they think the content is unoriginal, boring, irrelevant, or deceptive. Simply calling it “content” and not “marketing” doesn’t mean they’ll find it more valuable than a typical ad. Fortunately, one cultural touchpoint is rich with insight into the personalities of Millennials and what moves them as consumers. Enter the Teenage Mutant Ninja Turtles. While it might sound trivial, everyone’s favorite “lean, mean, green fighting machines” are a phenomenal starting point that unlock the four basic personality types of Millennials that can better inform your personas and ultimately help you create content that resonates as valuable with Millennials. 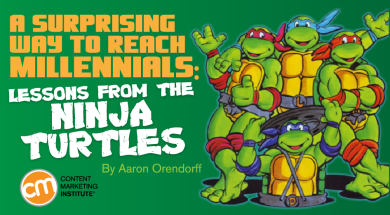 And that’s exactly why I outline the four turtles-as-Millennials profiles along with stats, tips, and tools for reaching each one. Michelangelo is easygoing and easy to get along with. A fun-loving and free-spirited turtle, he has a Southern Cal-style with a creative, artistic, and adventurous side. He’s also the most frustrating Millennial … a fickle demographic easy to dismiss as a class clown. In financial terms, those who fall under this archetype spend money they don’t have, buy experiences instead of things, and quit jobs they need because they don’t “feel” fulfilled. They’re also single. Just 26% of Millennials in the United States are married, compared with 36% of Generation X, 48% of Baby Boomers, and 65% of the Silent Generation. Collect, curate, and share fun content that doesn’t come from your own content marketing team. Use tools like memit that allow your organization to collect, tag, and share their favorite finds across departments and within teams. Go the extra curation mile and create an online hub that’s both an internal resource as well as a customer-facing sub-site. 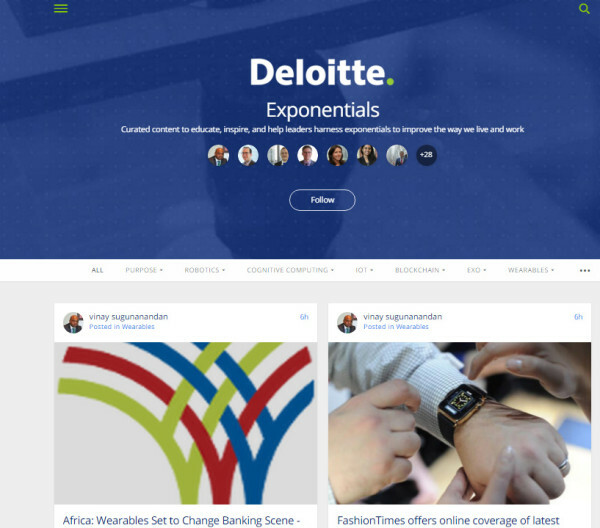 Pressly, for example, specializes in designing beautiful two-for-one interfaces, like this one for the enterprise Deloitte. Get playful with memes, games, and quizzes. The more frivolous, the better. Fun equals fans. Donnie is a renaissance man, though his persona can work for both genders. He’s a scientist, an engineer, and an inventor. In other words, he’s the brains. Millennials can be bright and ingenious. Growing up as digital natives has given them a unique position in the marketing world. Not only do the vast majority of Millennials own smartphones, but more than 85 percent of Millennials use them when making purchase decisions. Add to this the fact that U.S. Millennials touch their smartphones an average 45 times a day and you have the makings of an undeniable marketing opportunity. Invest in omnichannel marketing. Develop content that recognizes the back and forth between online and in-store experiences. Adaptive content is a key technique to implementing. Prioritize free and in-depth webinars that attract early adopters and dig into practical how-to examples. Always include live surveys, polls, and question-and-answer sessions. Consider the advantages of a mobile or web app that allows you to gamify data gathering and the purchasing process. Don’t discount content and wearable tech. Many Millennials have been dreaming about wrist communications devices since they first watched the Power Rangers. Leonardo is logical and strategic. He’s slowly growing into his role as commander and believes in the greater good. Like Leo, this type of Millennial is methodical and educated. One-third of older Millennials (ages 26 to 33) have earned at least a four-year college degree, making them the most-educated young adults in U.S. history. What’s more, 46% request price matches from online retailers prior to purchase. Provide detailed explanations of product features backed up by impartial data. Prioritize customer reviews and ratings. For help, check out this guide and infographic I put together for Salesforce. Create custom offers based on each visitor’s digital body language. In-depth segmentation tools like Fanplayr take real-time factors – product views, price ranges, past purchases, and referral sources – into account when creating calls to action. Highlight social proof from authorities and thought leaders your audience respects. Don’t violate their trust with hype. Create value-real conversations and no-nonsense calls to action. Raphael is the bad-boy turtle. Never one to bite his tongue, he’s sarcastic, fierce, and has a sense of humor that is totally deadpan. Likewise, some Millennials can come off as cynical, egotistical, and self-consumed: the so-called “selfie generation.” Eighty-seven percent of 18-25 year olds in the United States use Facebook. Fifty-three percent are on Instagram, 37% are on Twitter, and 34% are on Pinterest. Making your content marketing story-driven – Focus on your brand’s artistic side, your passions, and especially your failures. Authenticity matters. 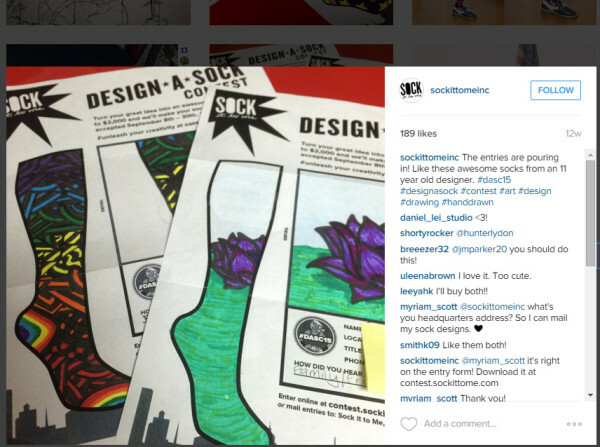 Crowdsourcing ideas and contests – Last October, Sock It to Me was able to rake in 4,600 submissions for its simple design-a-sock contest. Beefing up social campaigns – Use a post-management platform like Oktopost, which is especially vital for tracking real-world ROI not just “likes,” shares, retweets, and pins. Not all Millennials are created the same. While far more than four subtypes exist, this division is a profitable and fun starting point. Line up the four Teenage Mutant Ninja Turtles with your own buyer personas and see what tips work best for you. Expand your knowledge and boost your content marketing success. Start with two free e-courses and sign up for CMI’s comprehensive online training & certification program, which contains over 19 hours of must-know strategies, tactics and best practices, delivered by leading experts.